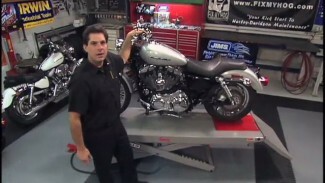 Bob walks us through Harley primary oil change on Dyna and Softail models noting Primary Chain Adjustment is not longer need on TC 96, 103 and 110. Remove the drain plug, derby cover and let drain. Prep the drain plug with a little Loctite thread sealant and thread in by hand and torque to spec. Bob uses a clean funnel to pour in fresh fluids and he brings this primary up to snuff.